Two UTA social work professors are using an NIH grant to find ways to reduce stress of families caring for loved ones with Alzheimer's disease. Noelle Fields and Ling Xu, both assistant professors in The University of Texas at Arlington's School of Social Work, were awarded a $459,994 National Institutes of Health grant for their research titled "The Senior Companion Program Plus (SCP Plus): A Psychoeducational Intervention for African American Dementia Caregivers." 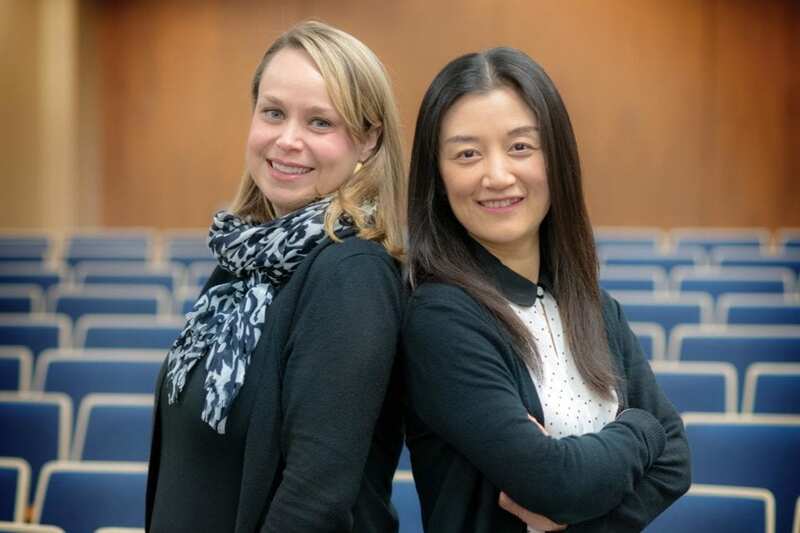 "This grant means that Ling and I are taking the next step in our research careers by conducting meaningful community-based research that is funded externally, in hopes of leading to future grants related to family caregiving and aging," Fields said. "The School of Social Work also benefits from this grant because we are supporting numerous students and strengthening the research environment in the School and University as a whole." The research project aims to reduce caregiver burden and stress, increase the well-being of the caregiver and grow caregivers' knowledge about Alzheimer's disease. They will be working with the Senior Companion Program which is part of the Corporation for National and Community Service. See a video about the research the professors are doing. "To date, few studies have utilized lay providers for dementia caregiving interventions and no studies have utilized the Senior Companion Program as a platform for this type of family caregiver intervention," Fields said. "Our intervention, the Senior Companion Program Plus (SCP Plus) augments the Senior Companion Program by adding a component specific to dementia family caregivers." According to the latest research from the Alzheimer's Association, Alzheimer's disease and related dementia will triple during the next 30 years and African-Americans are disproportionately affected by the disease. "Family caregivers are the main providers of support to people with dementia, and they are faced with many challenges in their role compared to non-dementia caregivers," Xu said. "Those challenges may include high levels of stress, depression, anxiety and health impairments." More caregiver services and programs are needed to sustain families during the challenges of this type of family caregiving, Fields and Xu said. The SCP Plus takes into consideration the needs and strengths of African-American families. Overall, the goal of the study is to create a cost-effective and sustainable intervention for family caregivers that Senior Companion Programs can utilize across the nation. "Our goal is to design, deliver and evaluate a psychoeducational intervention for African-American dementia family caregivers utilizing Senior Companions as lay providers of the SCP Plus program," Fields said. Fields and Xu are very optimistic about the impact this award will have on their research. "The grant is helping us to expand on our pilot study of the SCP Plus to several sites," Xu said. "This award will lead to future studies of family caregiver interventions." The impact of their research doesn't stop there, however. Students at the School of Social Work also will benefit because of the research Fields and Xu are conducting. "We are thrilled that the funding will support not only our study, but also will support social work students who will be paid as research assistants, as well as support the infrastructure of the UTA School of Social Work," Xu said. According to the two researchers, community partners such as the Senior Source, Inc. in Dallas have been very supportive in helping design and implement innovative and impactful research. Strategic Plan 2020: Bold Solutions | Global Impact.